Prime Minister calls on Europeans to be fair toward Israel, in address to a conference of global information technology leaders at Davos. Prime Minister Benjamin Netanyahu addressed a conference of global information technology leaders Thursday at the 2014 World Economic Forum Annual Meeting in Davos, and praised Israel as “an innovation nation” that has become “a nexus of high technology” and a center for entrepreneurship, but also delivered a political message to European nations. Netanyahu said Europe could make a positive contribution in the Middle East but warned that it could also have a "negative effect." "If Europe is seen to be one-sided and if Europe is seen to be unfairly pressing on Israel, it hardens the Palestinian position and coincidentally it hardens the Israeli position because people respond that way to these kinds of undue pressures," Netanyahu told Davos delegates. "I think if Europe maintains its fairness and its balance, I think it can contribute a great deal," he added. Tension between Israel and EU nations was recently stoked when the EU summoned Israel's envoys Thursday to explain Israel's continued construction in Judea and Samaria. In response, Foreign Minister Avigdor Liberman summoned European Union (EU) ambassadors on Friday over continued support of - and bias for - the Palestinian Authority (PA) in negotiations. 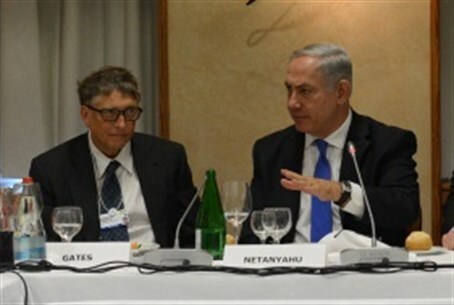 Netanyahu devoted his main address at Davos to Israel's technological prowess. The basis on which the start-up companies can take off is a sound economy, in which budget constraints are respected and macroenonmics are properly managed, he stated. He explained that the fact that young Israelis serve in Israel's military in technological fields is "reason number one" for the innovative leadership Israel has developed, aside from sound economics. The military service is a "perpetual machine" that perpetually churns out new generations of knowledge workers and knowledge enterpreneurs. The second reason is Israel's exceptional research institutes and the high share of the GDP that Israel invests in research. Netanyahu added that Jewish culture, and the emphasis on developing "the questioning mind" that began in Talmudic times, is also a factor working in Israel's favor as regards innovation. Israel's small size, and the fact that Israel does not have abundant natural resources, also have forced Israel to innovate in order to survive. Israel "develops more conceptual products per capita than any nation on earth," he claimed. In a separate statement, Netanyahu added that sophisticated defensive capabilities are a prerequisite for any technology, and Israel is investing in teaching the subject at the secondary level, with the recently formed Israel National Cyber Bureau expanding cooperation with institutions of higher education in the country. Israel is interested in sharing with the world the considerable know-how that it has accumulated in protecting industries from technology-based attacks, he added. Cyber studies are part of the curriculum in Israeli high schools, including as part of the Magshimim program to encourage excellence, training and development in the cyber and computer fields among 16-18-year-old youth in the periphery, noted Netanyahu. In December 2013, the government approved the creation of the Digital Israel initiative which is designed to find innovative ways to provide digital services to the public via the use of advanced technologies that allow for the rapid transfer of high-volume content over a fiber-optic – or other – infrastructure. The initiative will facilitate public links with, and accessibility to, the education, health and social welfare systems in the State of Israel while reducing geographic and social gaps, thus drawing the periphery closer to the center, said Netanyahu. In the future, he added, the initiative will be expanded to other relevant government ministries. The initiative will also promote the infusion of technological tools in both the business and public sectors, including in small businesses by encouraging online commerce and sharing information, reducing bureaucracy and using online means to improve public service efficiency without having to leave one's home.